The first castle on this site is referred to in 1119 as the Tower of Kingorne Wester, (to distinguish it from the Tower of Kingorne Easter, later known as Glamis Castle), and consisted of a simple stone keep (sited at the south east corner of the present castle). This ancient castle was obviously added to, as the current castle is said to incorporate elements of a 13th century structure in it’s ground floor level. It has been speculated that these earlier remains may be part of an ecclesiastical building, as the castle’s west wing (the oldest part) is oriented east-west, and features small church-like lancet windows (as well as later gun loops). In the 13th century the castle seems to have been owned by the Abbots of Dunfermline, or possibly by the Durie family, who were hereditary stewards to the Abbots, and was sometimes known as the Abbot’s Hall. 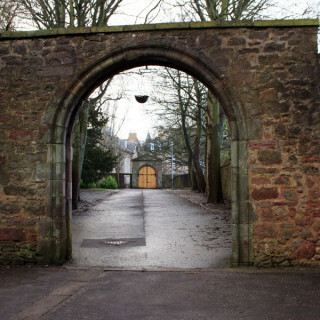 By 1382 it seems to be in the possession of the Durie family, although it isn’t until 1538 that this fact is confirmed, when George Durie, the then Abbot of Dunfermline, grants the “keep or fort” of Kinghorne Wester (ie the present Rossend Castle) to his son Peter. Between 1552 and 1554 Peter Durie rebuilt and enlarged the original keep. The tower was extended to the north, and a square stair tower was added to the north east corner, making the castle L-plan in shape. At the bottom of the stair tower was a new main entrance at ground level, giving access to a wide turnpike stair. The ground floor was partly vaulted and consisted of a kitchen with huge fireplace in the new portion, and storage cellars in the old portion. Below this it is said there are “dungeons”, possibly a pit prison. On the first floor, above the kitchen, was the main hall, measuring around 7.9 metres by 5.2 metres, and beyond that was a chamber which is now known as Queen Mary’s Room (see below) which could be accessed from the ground floor via a small spiral staircase within the wall. The second floor is divided into three further chambers, and here the main staircase stops. The third (attic) floor is accessed by a small inter-mural spiral staircase just off the main staircase, with a cap house over the main stair. Presumably as a tribute to his father, Peter installed a panel over the entrance carved with the arms of George Durie and the date 22nd of May 1554. At the same time a carved stone was added to the east wall of the castle, carrying the arms of St Margaret, the founder of Dunfermline Abbey. It may be that these two carvings were commissioned to commemorate the appointment of George Durie as Keeper of the Privy Seal by Mary of Guise in 1554. 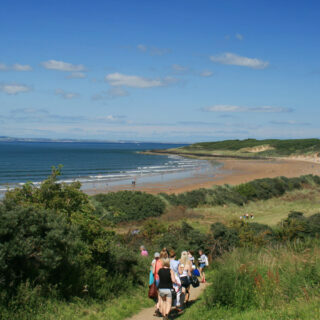 It is said that George Durie brought the relics of St Margaret to Burntisland Castle, as it was then known, where they remained for some time before being taken to the Jesuit College at Douai, northern France. In 1560 the Scottish Reformation took place, and the Duries lost Burntisland Castle, it being given to the Melville family. Mary Queen of Scots was said to have been a regular visitor to the castle, staying in a chamber in the main tower. She certainly visited in February 1562, when she was surprised in her bedchamber by one of her retinue, a young Frenchman named Du Châtelard. He was later executed for this faux pas. 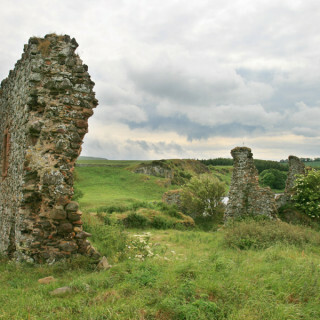 The Melvilles’ ownership didn’t last long however, and the castle was given to Sir William Kirkcaldy of Grange. But when he held Edinburgh Castle for Mary in 1573, he was captured, hanged, and his estates were forfeited. James VI restored Kirkcaldy’s estates to his heirs in 1581, and since one of Kirkcaldy’s daughters seems to have married a Melville, the castle seems to have passed to that family. In 1585 James VI granted Burntisland Castle to Sir Robert Melville, son of Sir Robert Melville of Murdocairnie who had held Linlithgow Palace for James’ mother Mary towards the end of her reign (and who was the son-in-law of Sir William Kirkcaldy of Grange). In the late 16th century the castle was extended by the Melvilles, with a new wing projecting from the centre of the tower to the west, effectively doubling the size of the castle and making the castle T-plan in shape. 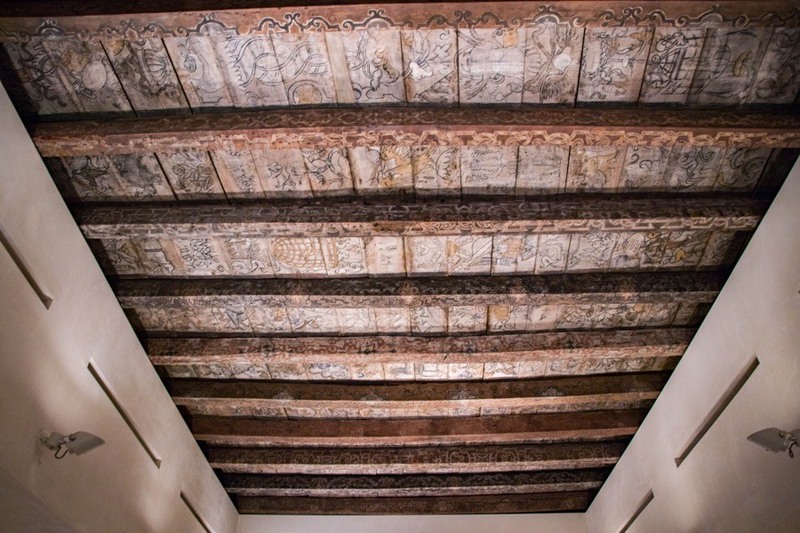 It was possibly around this time that a magnificent painted wooden ceiling was installed in the main hall of the existing tower. 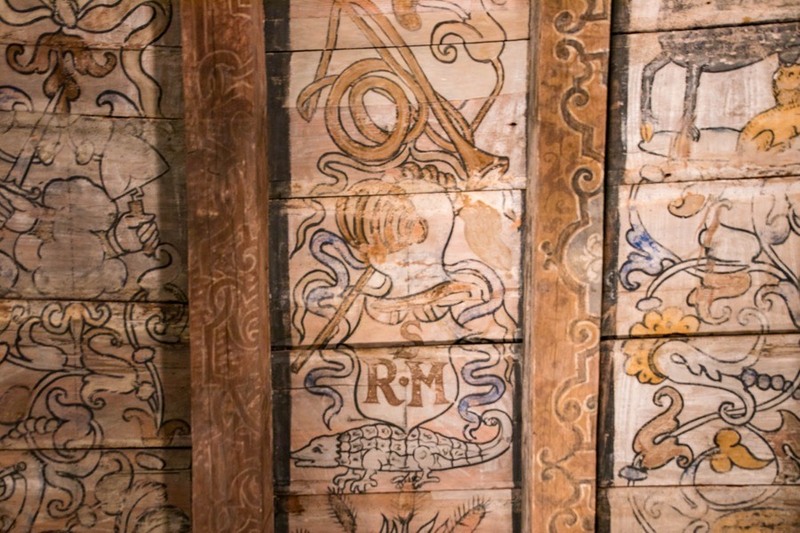 Carrying the initials SRM (most likely for Sir Robert Melville of Burntisland, or possibly for his father, dating it to between 1581 and 1621), the ceiling features a complex arrangement of patterns and symbolic devices. 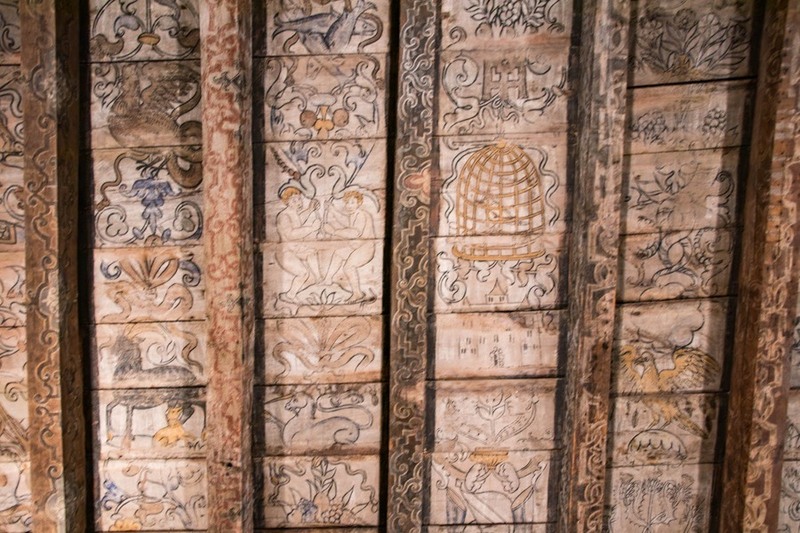 The ceiling may have been painted in anticipation of James VI’s visit to the castle in 1617. 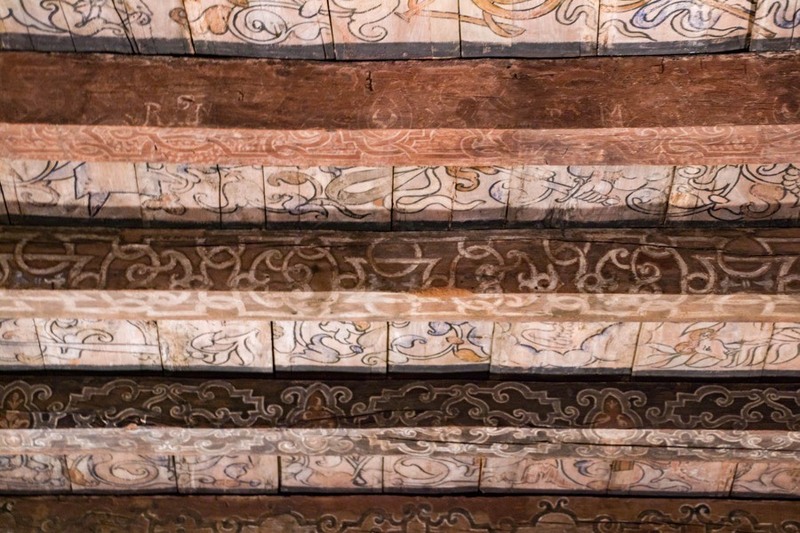 It was re-discovered under a later plaster ceiling in 1957 and is now in the National Museum of Scotland in Edinburgh. 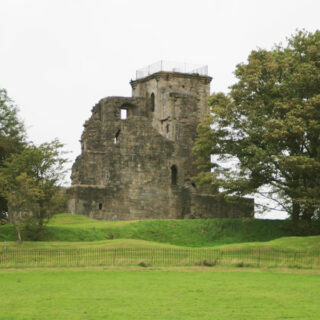 The castle served as the local headquarters for the Covenanters during the civil wars of the mid-17th century, but in 1651 it was captured by Oliver Cromwell’s troops. Following Cromwell’s departure the castle reverted to the Melville family. Some time after this the castle was acquired from the Melvilles by Sir James Wemyss of Caskieberry, who made alterations to the top floor. A carved stone dormer window pediment carries the date 1665. High up on the north side of the projecting wing of the castle, where the stair tower joins the main tower, is a carved triangular stone featuring the initials “SJ” and “W” (presumably for Sir James Wemyss) and the date 1665. This would originally have been a dormer window pediment, but is now isolated below the roofline which was obviously raised again later. Rossend Castle was occupied by the Earl of Mar during the Jacobite Rising of 1715. By 1765 the castle was owned by a merchant and writer named Murdoch Campbell from Thurso, who renamed it Rossend Castle. The castle passed to Campbell’s only daughter, Jean or Jane, who married an officer in the Royal Engineers named Robert Beatson of Kilrie in 1790. Robert’s older brother was Major General Alexander Beatson, who would go on to be Governor of St Helena between 1808 and 1813. In the early 19th century the castle was extended once again, with a three storey castellated block built on the north side to the right of the main entrance, following the line of the stair tower, and a small porch added to the entrance. The top of the old tower at the south-east corner was given a castellated finish at this time. A later Governor of St Helena, Major-General Edward Swift Broughton, married Barbara Beatson, daughter of Robert Beatson and Jean Campbell. On a map of 1824 Rossend Castle and estate are described as belonging to a Miss Broughton. 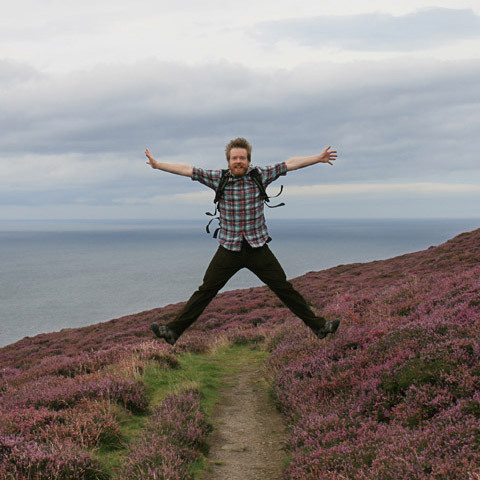 Rossend seems to have been owned by various Beatsons and Broughtons during the 19th century, as well as by a William Alexander Lawrie who married a Harriette Beaton. Lawrie is said to have been responsible for collecting and preserving many artefacts relating to the castle, including suits of armour and Queen Mary’s Bed. Lawrie was also responsible for building an entrance gateway to the north-east of the castle, apparently based on one of the Bars in York, and inscribing it with significant dates associated with the castle – 1119, 1382 and 1563. In 1873 the castle and estate was bought by James Shepherd, who owned a linoleum manufacturing factory in Kirkcaldy. Following Shepherd’s death Rossend was put up for sale in 1907, and it was bought by Burntisland Town Council along with the rights to the foreshore, which they required in order to extend the docks below the castle. The docks were developed, and the lands around the castle used for various purposes including new housing. The castle itself was leased to the Gold sisters of Colinswell House, former maids to Shepherd, who ran it as a boarding school until 1952. By the 1960s the castle was in a very poor state of repair, and the Town Council wanted to demolish it, but it was saved following a public enquiry in 1972. In 1975 it was bought as a roofless ruin by Robert Hurd & Partners, a firm of architects, for £350, who set about restoring it. During restoration two secret stairs and ground floor stone vaults were discovered. At this time the wooden doors to Queen Mary’s Room were returned by the owners of the nearby Easterheughs Castle (built in 1946 in the style of a 16th or 17th century castle) who had bought them along with original wood panelling when Rossend was due to be demolished. As part of the restoration a round external stair tower was added to the south-west corner of the castle. The 19th century additions to the front of the castle were demolished, returning the castle to its 16th century T-plan shape. 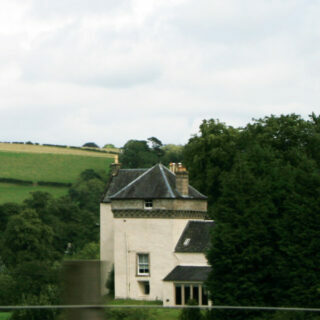 Rossend Castle now serves as Hurd Rolland’s Fife Office. Rossend Castle is in the parish of Burntisland and the county of Fife. Published on the 14th of May 2010 at 2:00 pm. Updated on the 12th of March 2018 at 3:16 pm.